Thousand Island dressing is an American salad dressing and condiment based on mayonnaise and can include olive oil, lemon juice, orange juice, paprika, Worcestershire sauce, mustard, vinegar, cream, chili sauce, tomato purée, ketchup or Tabasco sauce. It is one of the most common alternative spreads on a Reuben sandwich if one is not using Russian dressing. It also typically contains finely chopped ingredients, which can include pickles, onions, bell peppers, green olives, hard-boiled egg, parsley, pimento, chives, garlic, or chopped nuts (such as walnuts or chestnuts). According to The Oxford Companion to American Food and Drink, the dressing's name comes from the Thousand Islands region, located along the upper St. Lawrence River between the United States and Canada. Within that region, one common version of the dressing's origins says that a fishing guide's wife, Sophia LaLonde, made the condiment as part of her husband George's shore dinner. Often in this version, actress May Irwin requested the recipe after enjoying it. Irwin, in turn, gave it to another. In another, second version of the story, Thousand Islands summer resident, George Boldt, who built Boldt Castle between 1900 and 1904 and who was proprietor of the Waldorf-Astoria Hotel, instructed the hotel's maître d'hôtel, Oscar Tschirky, to put the dressing on the menu in 1894 after he forgot dressing on salads and improvised with what ingredients were on hand at the time. A 1959 National Geographic article states, "Thousand Island Dressing was reportedly developed by Boldt's chef." Despite claims that he was involved in the introduction of the salad dressing at the Waldorf, chef Tschirky did not mention the salad dressing in his cookbook that was published during that time period. When University of Wisconsin sociologist Michael Bell and his graduate students attempted to determine the origin of Thousand Island dressing in 2010, they found that the story differed among villages and islands in the Thousand Islands region. They discovered the existence of a third origin story in which the original recipe was based upon French dressing, which is supported by a recipe published in the 11th edition of The Fannie Farmer Cookbook (1965). All the claims appeared to be based upon oral traditions without supporting written records. According to Food & Wine magazine, the dressing was a traditional sauce from the late 19th century in the Thousand Islands region. The wealthy who visited the region carried bottles of the local sauce back to New York City, such as one variant found in Clayton, New York called Sophia's Sauce found at a local hotel, Herald Hotel run by innkeeper Sophia Lelonde. Some food writers advance the claim that the dressing was invented by chef Theo Rooms of the Blackstone Hotel in Chicago during the same time period. The food historians at the Food Timeline point out that the earliest print references to Thousand Island dressing appear in 1912, and that recipes for different versions of the dressing begin to appear afterwards throughout the U.S. It is widely used in fast-food restaurants and diners in the United States, where it is often referred to as "special sauce" or "secret sauce". An example of this is In-N-Out Burger's "spread", served on burgers and several "secret menu" items; despite its name, it is a variation of Thousand Island dressing. Thousand Island dressing is often used in a Reuben sandwich in lieu of Russian dressing. McDonald's Big Mac sauce is a variation on Thousand Island dressing. 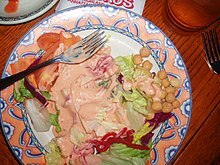 Rhode Island dressing (Rhode islandsås), introduced by the Swedish restaurateur Tore Wretman, is similar to Thousand Island and very popular in Sweden. Its name is confusing, especially for foreigners, and its origin unclear, since the dressing has no relationship to Rhode Island and the name is not used for similar preparations outside Sweden. In Germany, a similar salad dressing is called "American dressing". ^ Weaver, Louise Bennett; LeCron, Helen Cowles, eds. (1917). Thousand Island Dressing. A thousand ways to please a husband, with Bettina's best recipes. New York: Britton Publishing Company. p. 89. OCLC 657073250. ^ Grimes, Etta (May 1915). "Home Economics: Some choice recipes". The Oregon Countryman. p. 325. OCLC 42327071. ^ Hirtzler, Victor (1919). Thousand Island dressing, for salads. The Hotel St. Francis Cook Book. Chicago: The Hotel Monthly Press, John Willy, Inc. p. 335. OCLC 682274960. ^ Smith, Andrew F., ed. (2007). The Oxford Companion to American Food and Drink. Oxford University Press US. p. 514. ISBN 978-0-19-530796-2. OCLC 71833329. ^ a b c d e Stiles, Kaelyn; Altıok, Özlem; Bell, Michael M. (28 March 2010). "The ghosts of taste: food and the cultural politics of authenticity" (PDF). Agriculture and Human Values. 28 (2): 225–236. doi:10.1007/s10460-010-9265-y. Retrieved 30 January 2015. ^ McNeese, Tim (2005). The St. Lawrence River. Infobase Publishing. p. 113. ISBN 978-0-7910-8245-4. OCLC 56591404. ^ "Thousand Island Dressing, Enjoyed around the world and... "Made in Clayton!"". Thousand Islands Inn. Archived from the original on June 27, 2007. Retrieved January 29, 2015. ^ Tschirky, Oscar (1896). The Cook Book by "Oscar" of the Waldorf. Chicago & New York: The Werner Company. ^ a b Cazentre, Don (September 3, 2011). "Three versions of the origin of Thousand Island dressing". Syracuse Post-Standard. ^ Smith, Susan W. (September 13, 2013). "Evidence found for the origin of the Thousand Island Dressing!". Thousand Islands Life. ^ a b Matt Blitz (22 June 2017). "Who Invented Thousand Island Dressing?". Food & Wine. ^ Parsons, Russ (August 25, 1994). "Salad : Unfashionable Dressings: Which Thousand Islands?". Los Angeles Times. ^ "Iceberg Lettuce with Thousand Island Dressing". Saveur. May 7, 2007. ^ Olver, Lynne (January 3, 2015). "Thousand Island dressing". The Food Timeline. ^ J. Kenji López-Alt (July 23, 2010). "The Burger Lab: The Ins-n-Outs of an In-N-Out Double-Double, Animal-Style". Serious Eats. Retrieved March 29, 2015. ^ DiSpirito, Rocco (2010). Now Eat This! 150 of America's Favorite Comfort Foods, All Under 350 Calories. Random House. p. 75. ISBN 978-0-345-52090-6. OCLC 851387051. ^ "1900-talets viktigaste matprofil i Sverige" (in Swedish). Sveriges radio. ^ "Bästa såserna till skaldjuren och en lättgjord äppelpaj" (in Swedish). Sveriges television. ^ Kochbuch, Marions. "American Dressing". Marions Kochbuch. Folkert Knieper. Retrieved 7 August 2018. ^ Meena, Ava (29 January 2016). "American Food According to Germany". My Meena Life. Retrieved 7 August 2018. Look up thousand island dressing in Wiktionary, the free dictionary.